Did you know that the mitochondria is the powerhouse of the cell? Of course you do. And that’s because you had a teacher. Teachers, they say, are our second parents. They have taught us so many things that they are indispensable to all societies. They have honed us, shared to us their knowledge, and opened our eyes to the many realities of life. Just because today’s not Teachers’ Day, it doesn’t mean that you should not express your gratitude to those whose vocation in life is teaching. 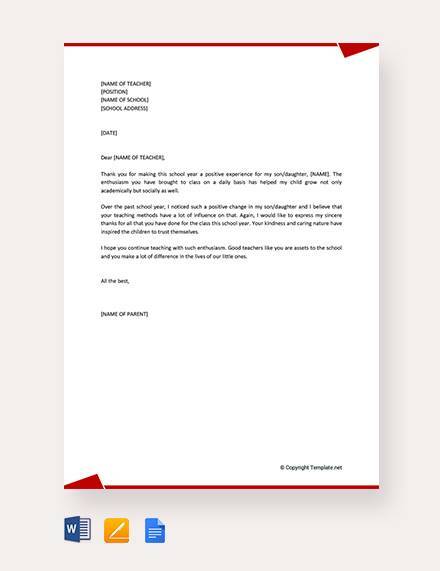 It’s high time you tell your teacher “Thank you” through writing a thank-you letter. 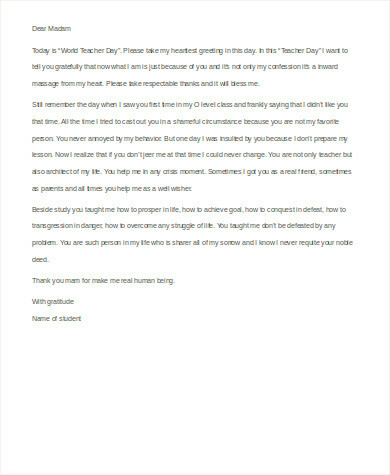 Read and examine our Sample Letters so you can thank your teacher on Teachers’ Day, his/her birthday, or just a random bout of gratitude. Observe grammar rules. It would be very embarrassing to commit grammar or spelling errors while writing to a teacher—a teacher. She might just return it to you with corrections and comments. Be genuine. Be sincere in your letter and avoid exaggerating your thanks. Explain why you appreciate them. Give details on why their effort or existence is something to be thankful for. Use paper with good quality. A good-smelling paper with soothing texture and firmness makes your letter more special. Avoid being too familiar. 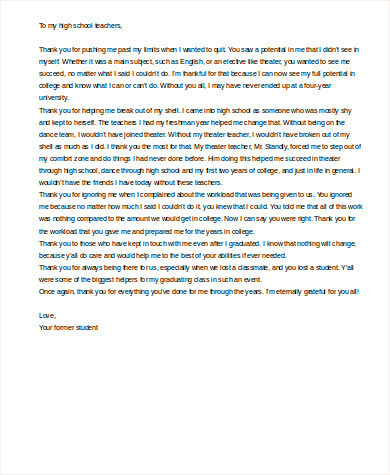 Even if a thank-you letter can be considered a personal letter, the teacher-student relationship remains a professional one. Avoid being too familiar with your teacher while also not being too formal. 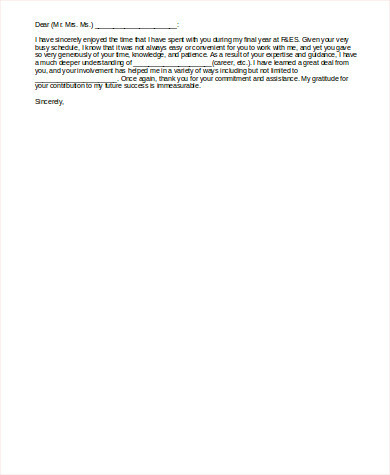 A thank-you letter, no matter for whom, can go a long way. 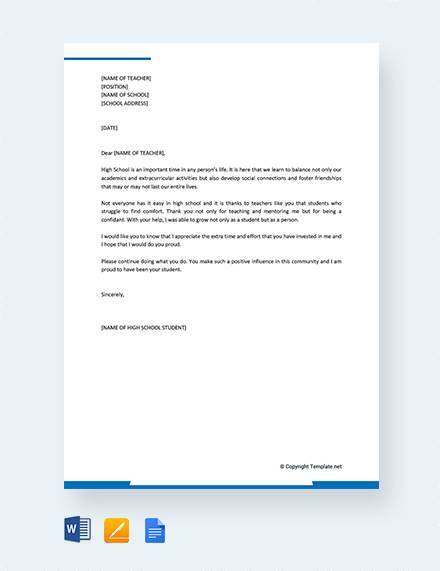 Our free downloadable sample thank-you letters for teachers can help you write a sincere thank-you letter, and your teacher will appreciate it. 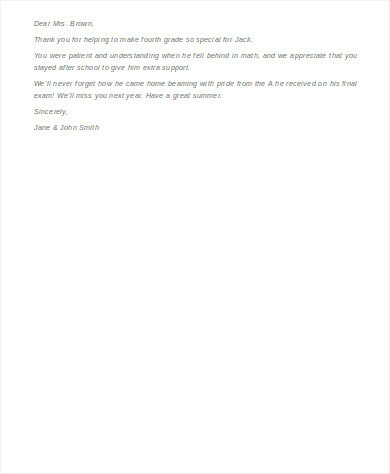 As a formal letter, a thank-you letter can help you advance your career. 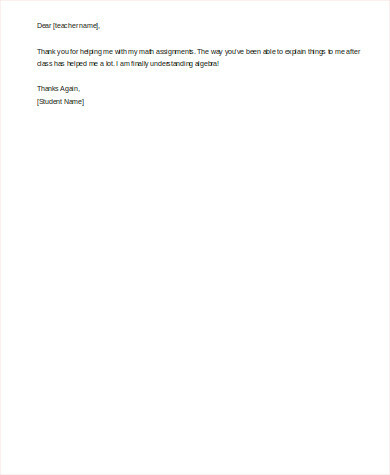 Check out our Sample Thank You Letters For Interview in case you need it someday. 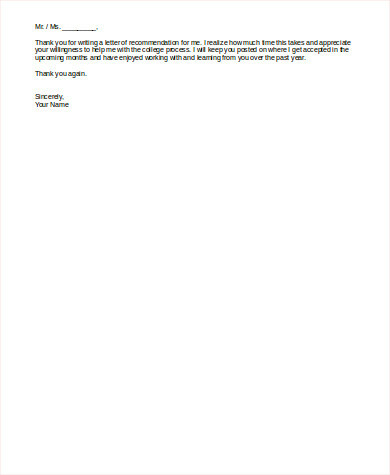 Our free sample thank-you letters come in Word (.doc) format. They cover many situations where your thanks would me much appreciated. But don’t wait for an opportune moment; every moment is ideal! 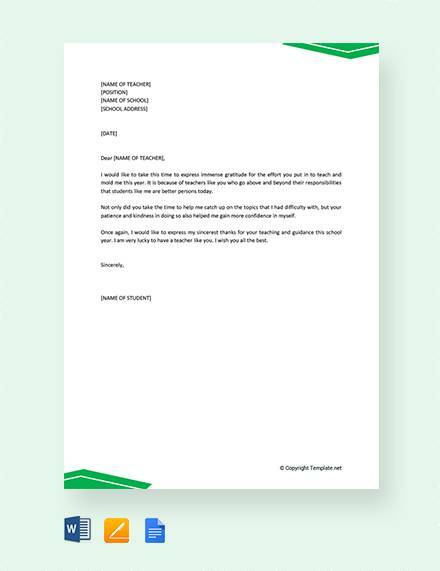 Learn more about thank-you letters by having a look at our free Sample Thank You Letters for Appreciation. Telling your teacher that you appreciate them truly brings happiness. Teaching, after all, does not bring material wealth or fame. Teachers do what they do out of love, not of some other motivation. 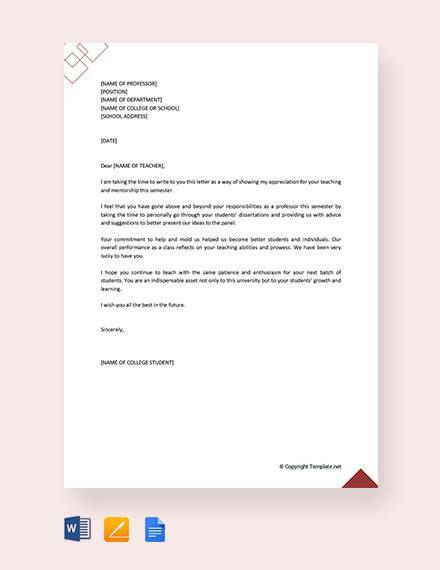 Study our free sample thank-you letters and show them your love by writing them one.